Editor’s note: The Ulster Buccaneers traveled to the MSBL World Series all the way from Northern Ireland and Northern England. They unfortunately finished 0-6 in their 35+ Cactus division but took note of what needs to be done to get back here and be more competitive. We caught up with Ulster assistant manager John Baxendale to discuss baseball in the United Kingdom. 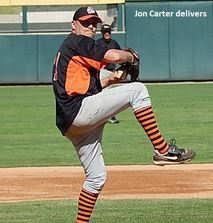 Manager Jon Carter was warming up in the bullpen. John Baxendale of the Ulster (Ireland) Buccaneers is the assistant coach, alongside manager Jon Carter. This isn’t news that is particularly noteworthy except that John lives in Northwestern England near Manchester and Jon Carter, also now living in England, was a catalyst in promoting baseball in Northern Ireland. Their Buccaneers just got done competing in the 30thanniversary division of this year’s MSBL World Series in the 35-over division. John mentioned to me that the Buccaneers are more than happy to speak with anyone who wants to play with them next time around. They will be sure to be more prepared, now that they know what to expect, and will definitely have more pitching. Want to play with the lads from the Emerald Isle? Let me know at msbllamontia@aol.com and I’ll hook you up with Jon.